At present, the Navy has two types of frigates: five of the "Álvaro de Bazán" class (F-100) and six of the "Santa María" class (FFG or F-80). The FFG frigates entered service from 1986, and all of them are in their last third of life. In 2021, they begin to their 35th year of service, so to maintain their current capabilities it will be necessary to replace them with the F-110 frigates. 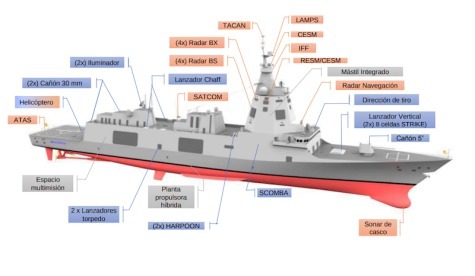 -- Construction of five frigates, including the corresponding accoutrements (life jackets, interior safety equipment, mooring ropes, etc.) and first installation parts of each vessel needed to ensure safe navigation without external support. -- Obtaining Integrated Logistic Support for the F-110 class, which entails the logistic information of the ship, the obtaining of logistic documentation (Maintenance Plan, Procurement Plan and Training Plan, technical manuals, maintenance documentation, support documentation to provisioning), as well as the necessary systems for the implementation of the Digital Model and Twin. -- Industrial training, operation and maintenance for the personnel of the Ministry of Defense involved in the construction of ships and equipment. The future F-110 frigates will be 145 meters long, have a beam of 18 meters, will displace 5,900 tonnes and have a crew of 145 people.